Batteries consist of two different metals suspended in an acidic solution. Is it possible to use the acid in a lemon to power a light? Try it to find out! 1 light-emitting diode (LED) component We recommend a red LED because they typically need lower voltages to glow than other colors, but many colors will work. The best LEDs for this experiment are designed to glow with a low current such as this set from Amazon, or you can purchase a lesser quantity from Mouser electronics. NOTE: Some retailers also sell lemon battery kits that can include a buzzer or a low voltage clock. These instructions assume you are using your lemon battery to make an LED glow. Ask your scientist to create a testable question. Roll one lemon on a hard surface while pushing down to break the cell walls and loosen up the juice inside. The sour (acidic) juice is needed for the chemical reaction that you are about to start. Insert one zinc electrode deep into one of the cuts, and one copper electrode deep into the other. Leave some sticking out so you can connect your wires to them. You have now made a lemon cell! Set the multimeter to measure DC voltage (V with a straight line). If it has scale options, set it to measure 2000 millivolts (2000m). Hook two alligator clips from your leads to the two electrodes. Attach red lead of the multimeter (+) to the copper electrode, and the black lead of the multimeter (-) to the zinc electrode. Measure the voltage from your lemon cell. The average lemon cell should read about 0.9–1.0 volts. Now set the multimeter to measure current (A with a squiggly line: mÃ/Ã). If it has scale options, set it to measure 1–20mÃ. Measure the current of your lemon cell. It should read a few tenths of a milliampere. Some multimeters are not sensitive enough to measure currents less than one milliampere, in which case you will see 0.0 as the reading. A red LED typically needs a voltage of 1.2–1.6 V, so we need more power to light the bulb. Follow steps 3-5 to make 3 or 4 more lemon cells. (Optional) If you have a multimeter, check each lemon battery to make sure it generates voltage and current. Connect the lemon batteries together using the wire test leads. Connect the zinc electrode on the first lemon to the copper electrode on the second lemon. Connect the zinc electrode on the second lemon to the copper electrode on the third lemon. Repeat if using more lemons. This type of connection is called a series circuit, and provides one path through which electricity can flow. Gently bend the lead wires of the LED apart from each other. Connect a lead wire from the copper electrode of the first lemon cell to the longer lead wire from the LED. Connect a lead wire from the zinc electrode of the third cell to the shorter wire of the LED. Turn down the room lights to see if your LED is glowing! If it isn’t, see the troubleshooting tips below. Ensure the electrodes are not touching inside lemon. Ensure the alligator clips on the test lead wires are not touching each other where you connect them to the LED. The wires from one lemon to the other have to be connected from zinc to copper in order for the electricity to flow. Is it an old lemon? The lemon needs to be juicy inside. Do you need to add more lemons? Is your LED broken? Or does it require a higher voltage to work? The quality of the copper and zinc can be problematic. Pennies are rarely pure copper. Try substituting a length of 14 gauge copper wire (common house wire). Experiment with different lengths and configurations of electrodes. Other sources of zinc and copper may be found in the plumbing department of a hardware store. Why did we need to clean the electrodes first? Dirt or grease on the electrodes may interfere with the conductivity of the metals. If the surface of the metal has oxidized, the oxidized surface will interfere with the conductivity of the metal as well. The fact that lemon juice is sour should give a hint about what kind of chemicals it’s made of. What do you think the sour flavor tells us? The citric acid in lemon juice is what makes the lemon taste sour, and acids contain ions which conduct electricity. The ions in acids ( H+ or protons) are part of the chemical reaction that helps to produce electricity. Why is it important that the electrodes do not touch each other inside the lemon? If the electrodes touch each other then you'll "short circuit" the battery and it won't work. So instead of the electrons flowing through the intended wires and circuit, they will flow directly between the electrodes in the lemon (path of least resistance). 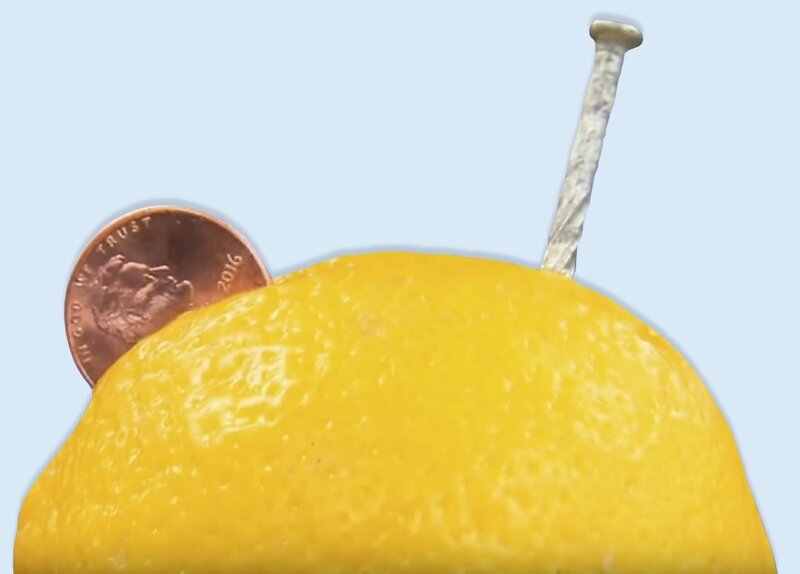 What happens if you put 3 nails and 3 pennies into ONE big, juicy lemon? Does it still light the LED? Experiment! If you push three nails and three copper pennies into the same lemon, you should get roughly three times as much electric current - as long as there's enough space in the lemon and enough lemon juice, the power is in the zinc. Not in the lemon. We used a lemon to provide the electrolyte for the battery. What if you used bottled lemon juice? Will vegetables or other fruits will work? Try a few to find out! Electrochemical cells, also called batteries, require three things—two electrodes and one electrolyte. One of the electrodes has to have a stronger desire for electrons than the other—in chemistry we say that it has a higher electronegativity. The electrode that wants the electrons more is called the cathode, and the one that gives up electrons is electropositive and is called the anode. Copper likes having electrons more than zinc so it’s more electronegative and is the cathode, leaving zinc to be the anode. An electrolyte is a solution that conducts electricity. The lemon provides citric acid, and acids contain ions which conduct electricity, making the lemon our electrolyte. When zinc is exposed to the acid in the lemon juice, the acid oxidizes—or removes electrons from the zinc. The resulting positively charged zinc ions move into the lemon juice, and the resulting electrons collect in the zinc metal. They then rush across the wire into the copper which wants electrons more than zinc. Those electrons, now in the copper, pull a couple of protons or hydrogen ions out of the acid and reduce them, adding electrons, which creates hydrogen gas. If we could see inside the lemon, we might be able to see very very tiny bubbles of hydrogen gas forming on the copper electrode. In summary, the electricity is not coming from the lemon by itself, but from the chemical reaction resulting from the differences in electronegativities between zinc and copper. A chemical reaction that consists of an oxidation reaction (a loss of electrons) and a reduction reaction (a gain of electrons).